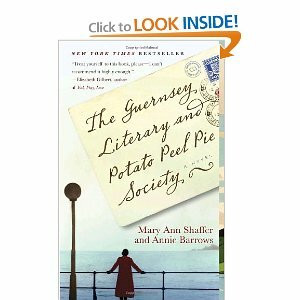 I finished reading The Guernsey Literary and Potato Peel Pie Society by Mary Ann Schaffer and Annie Barrows recently. I was looking for some historical fiction to read in the Kindle store and remembered that I'd heard a lot about this novel in 2008, when it was published. Guernsey is certainly a unique book. One--there are two authors. Mary Ann Schaffer, according to her niece Annie Barrows, was the family storyteller. She wrote and wrote and wrote, but never seemed to finish any of her manuscripts. In 1980, Mary Ann traveled to Guernsey, one of the Channel Islands in between the UK and France and spent 36 hours in the Guernsey airport due to the weather. She ended up reading every book in the airport library, about Guernsey history, in particular the occupation of the Channel Islands by the Nazis during World War Two. Annie Barrows says that her aunt didn't really start writing the novel until 2000 and then, finally, finished a book. However, as the manuscript was accepted by the publisher, Mary Ann became sick. As the edits came back, she asked her niece, Annie, an author, to rewrite what needed to be rewritten. Mary Ann died before the novel was published. Two--subject matter and setting. In the United States' perception of World War Two, we get Pearl Harbor, D-Day, the Holocaust, and sometimes, Japanese internment. World War Two has been told, analyzed, and re-told countless times in the U.S, so that there seems to be WWII overload sometimes. But then, there are different aspects to the war. Guernsey, with Jersey and the other Channel Isles, were under German occupation from June 1940 until the Islands were liberated in 1945. The majority of Guernsey's children were evacuated to England for the duration of the war ahead of the occupation. Guernsey was cut off from England for the entire war. The Germans instituted curfews, carefully kept count of every remaining islander's livestock and crops, outlawed wireless radios. In the novel, the Guernsey characters are at Amelia Maugery's house enjoying a roast pig and end up leaving her house after curfew. The quick-thinking Elizabeth McKenna tells the German soldiers that they were caught up in reading and discussing a book. To make a lie into the truth, the friends buy up all the books at the one bookstore on the island and each choose a book to read. At meetings, they eat potato peel pie (potatoes being a cheap food source; Guernsey's islanders were increasingly deprived of food as the war went on) and each member discusses whatever book they have been reading. The novel begins in 1946, when Juliet Ashton, a London newspaper columnist, is looking around for a new topic to write about. She receives a letter from Dawsey Adams of Guernsey, who has come across a book with Juliet's name and address on the flyleaf. Three--style. This is an epistolary novel. I have only ever read one other epistolary novel that I can remember--Love, Rosie by Cecelia Ahern. The story is told in letters. In some ways, epistolary novels can seem choppy and a little contrived (at least, when I used to read the Dear America series, I thought that those diary entries were awfully detailed...). But in this book, the letters take on the voices of the characters, which is really interesting. The only part I wished had been traditional narrative were the incidents that Elizabeth McKenna faced in the latter part of the novel. That's sad Mary Ann didn't get to see her book out there, but I'm glad she died knowing it was going to happen. I've read a few epistolary novels. Both fiction and non-fiction. Given the subject matter, it makes sense. It sounds like a fun and interesting read. Potato Peel Society. Lol! I love that. As far as non-fiction goes, I have a book of Tolkien's letters and a book with a few of John Keats' letters. I used to read this YA series called Dear America, which were novels written as diaries. What were the other epistolary novels you've read? Despite what could easily be a more dramatic, dark wartime story, Guernsey has a lightness that makes it an easy read. A few of them have been issue novels revolving around some kind of eating disorder: my favorite being this old one from the 90s called Fat Chance. More recently, I've read "Letters to a Young Poet." My sister gave it to me the last time I talked about giving up on writing. Lol! You know, someone gave me "Letters to a Young Poet" and I never read it.